This Altadena orchard is under planted with native plants. This is possible using different irrigation valves to control the water going to trees and plants with different needs. The Epilobium route 66 is obviously very happy in this situation. Salvia bee's bliss also thrives in this south facing garden. There was so much old and deteriorated concrete to be demolished in this garden, along with an enormous and unusable swimming pool. We were able to recycle all of it and ended up with this comfortable space surrounded by native and compatible plants. We were also able to extend the eucalyptus fencing thanks to the neighbor's provision of the beautiful lumber. Alas, we had to remove a number of sickly red gum eucalyptus trees from a hillside property. Fortunately, the lumber could be milled by a portable mill brought to the site and, although much of the timber remains stickered and stored for future use, we were able to use the weighty split branches and trunk crotches in combination with concrete slabs to create a garden living area. Some of the planks made excellent fencing. When this garden matures it will be full of seeds and fruits for the local bird population. Goldfinches love it and bees and butterflies have moved in. Those industrious birds cleverly planted the sunflowers for a more reliable food source now! For removing her lawn the owner was rewarded with a generous rebate from the local water agency. The first picture was taken in January and the others just five months later in June. What a difference spring rain makes. This rambunctious natural garden filled with a mix of California native plants and Mediterrean species, just installed in October 2011, replaced a lawn partially shaded by a lovely old sycamore. The space has the lush feel of an English country garden. 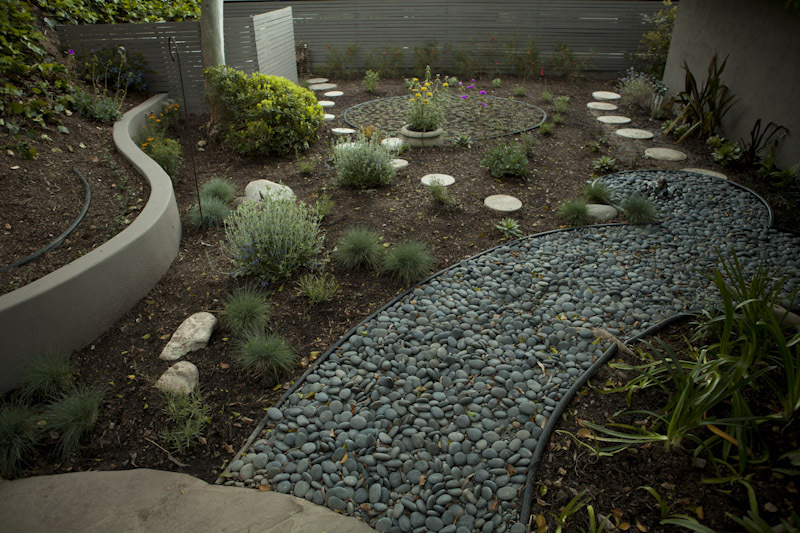 The client wished for a lively mix of plants surrounding the large boulders excavated from the site. The owners of this lovely craftsman house, situated in oak woodlands, needed a garden that gave them space for their frequent events. There are daily visits from a herd of deer so the plant palette was rather limited by their hunger as well as the prevalent shade. 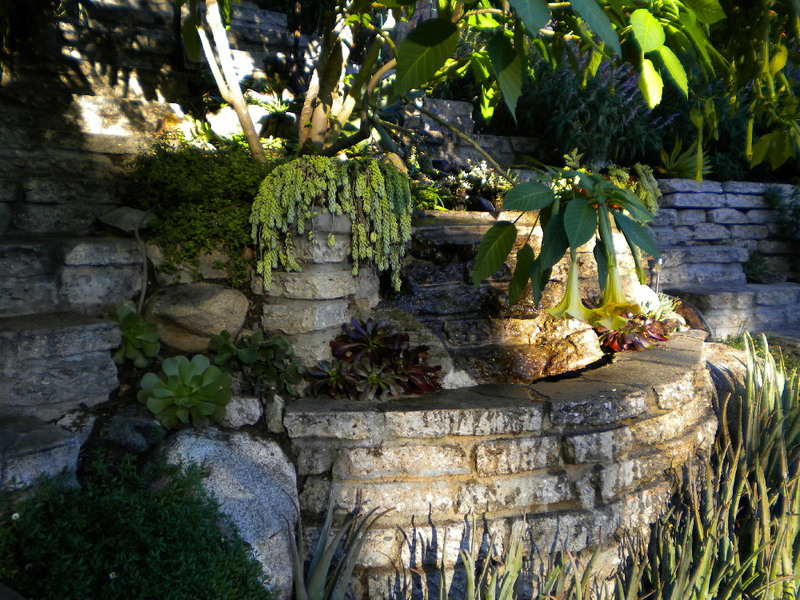 The plants are a sturdy mixture of California natives, shade loving Mediterranean and succulent plants. This stylish modern house needed visual stablilization in the front yard, and a rectilinear design was chosen. The backyard in contrast is curvilinear. Many of the plants chosen for both areas are California natives. The backyard is a relaxing space full of flowers, birds, butterflies and bees. Instead of the lawn there is now a comfortable dining area and a colorful garden. The fountain receptacle is covered with pebbles to prevent evaporation, and to allow birds to sip as they contemplate Buddha. This small courtyard garden surrounded by assorted neighboring garage walls is sustainably designed. 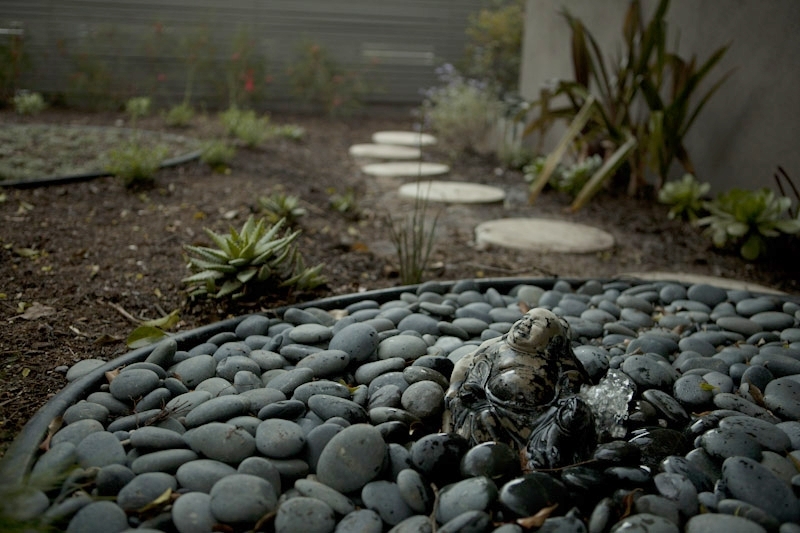 A 750 gallon water tank collects rainwater from a neighboring roof pitched into the garden and, in tandem with a deep gravel seepage pit in the center of the space, collects water before it penetrates the basement. 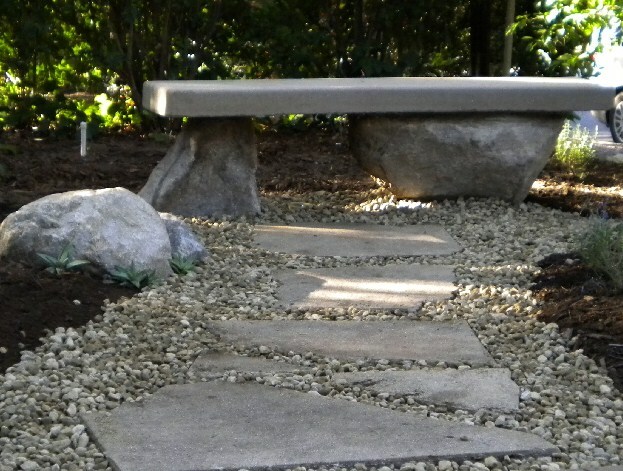 The concrete benches and paving are recycled. The fountain is covered to allow birds to perch and to prevent evaporation. The gas firepit was poured in place. Most of the plants are native, chosen to feed pollinators. Here it is again, just as good as when we first built it. We pulled out all the overgrown pond plants and repaired the pump that the raccoons messed with and the sound is most relaxing. New bench with recycled concrete from old driveway. We found this nice fellow in the garden on October 13. It's a California whipsnake, Masticophis lateralis lateralis. This is probably a very happy snake as we have so many lizards for it to eat. Luckily they are very shy of us and speedy too. OK, well we have lots of problems with honey bees, which are dying by the million. So far there is not a lot we can do about that, other than eschew pesticides in our gardens. Look what we spotted in the Dalea bi-color today - a very happy lynx spider dining on an unfortunate honey bee. There are also many species of wild bees and they are very busy pollinators, valuable in the garden and small farms bordering wild lands. We have many in our garden and they too love the Dalea, a heavy bloomer in fall, and a light bloom in spring. It turns out that all that mulching that we do to save water is very detrimental to wild bees who live in small nests in the ground. Apparently the bees cannot find their way to the soil. Native bees need bare ground in which to nest. The natural leaf litter lying under trees and shrubs is not a problem, just the thick layer of wood chips that many of us lay out to stop evaporation. So we're down to the nub of the matter. If we want to promote native bees we should leave the ground alone, no blowing, mulch around the plants, and leave some bare areas. There is always something that comes up when we think we are doing it right. Of course, native bees like native plants. Quercus agrifolia, California's glorious live oak, should only be trimmed in the late summer. There is currently a fashion for lacing these trees. Don't do it. It is bad for the tree and can cause disease. The only reason to prune an oak tree heavily (or any tree for that matter) is if it presents a danger for instance by overhanging a roof. It is OK to cut limbs of less than 1" in diameter and dead wood of course, provided it's done in the dormant period in late summer/early autumn. Use a licensed arborist to trim your valuable trees. Summer finally arrived a couple of months late. The long spring has caused a lot of growth and consequently, darn it, a lot of chopping to be done. I have read that Salvia greggii should not be pruned or deadheaded. However, my experience has been that, if I don't prune them after blooming, Salvia greggii becomes woody and suffers more from drought. It is native to Mexico where there are summer thunderstorms. Californian summers are much drier and large plants are stressed in our climate. You can water salvias once a month, or let them dry out completely. They almost always leaf out again in the rainy season. Salvia chamedryoides always does better if it is clipped back after spring and fall blooming. This Salvia enjoys part shade inland, or sunshine at the beach. Once established it is drought tolerant, but as it is also from northern Mexico a monthly soaking in summer will improve its looks. The silver leaves and bright blue flowers make this plant irresistable. Late spring or early summer is the time to cut back Matijila poppies, after blooming. I cut them back to the ground every summer or else they become leggy and unattractive. Rain will bring them right back to life. Now this is one of my favorite small trees from Australia. It is full of character, unruly but compact, and bursts forth with thousands of pink pompoms in summer. Bees love it. It will grow quite quickly and with virtually no irrigation. I have four growing in sandy soil at the top of a hill but they do very well in that dry location with monthly irrigation. Go to the bluffs in Santa Monica to see some really old melaleucas. They have been pruned well to show their lovely papery trunks. It should be given space as it will often take an unexpected direction and grow up, then sideways. It's a wonderful small tree for a xeriscape garden and looks good with native California plants as well as cactus. 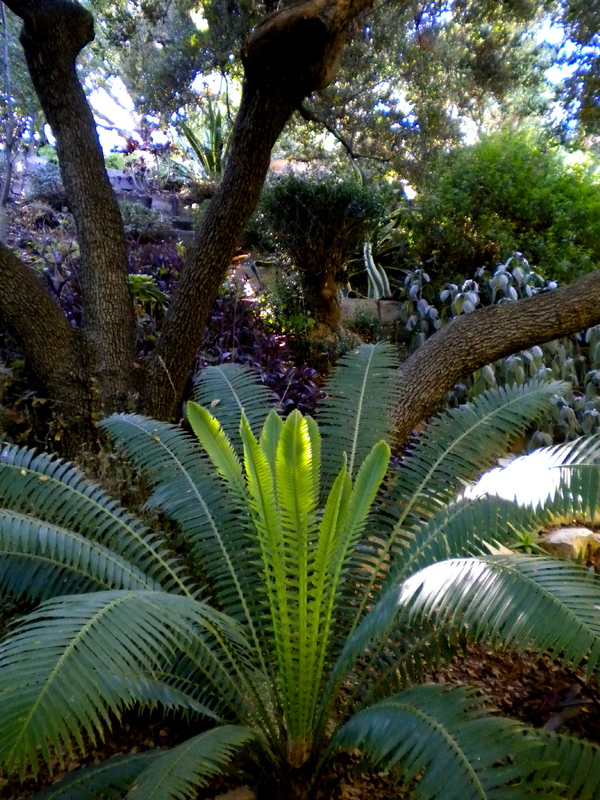 Cycads are among the oldest and most primitive plants on the planet. They are easy to grow and can be grown under live oaks as they require very little water once established. I water mine by hand once a month during the summer and the oaks sheltering canopy protects the cycads from frost and excessive sunshine. 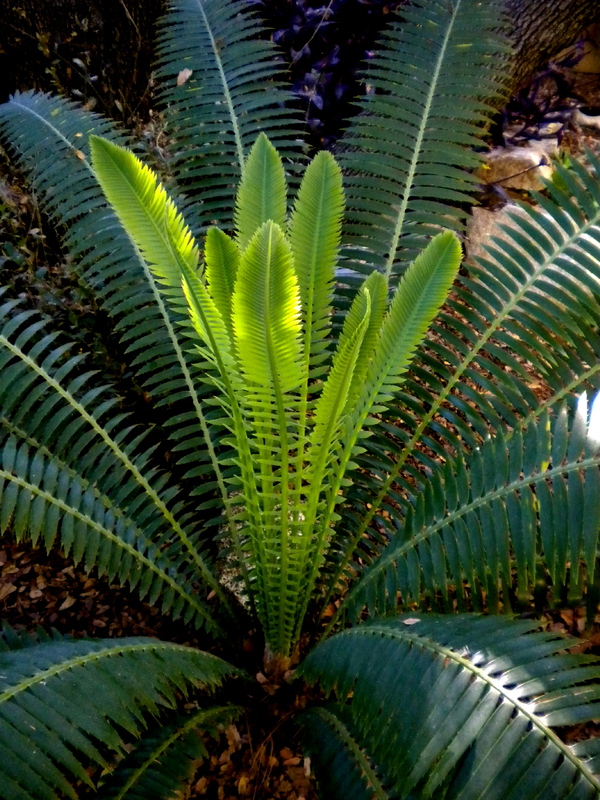 Cycads are crowning beautifully this year because last winter was a wet one. Is your garden full of birds? Mine is, and I have a cat. I don't want to confine her to the house so I put a bell on her collar. I found that one bell on her collar isn't enough to alert the birds as she is a clever minx and walks carefully so as not to tinkle. Now she wears three bells and she can't figure out how to stop them all from tinkling. She hasn't been able to catch a single bird since wearing three bells.